i purchased this shirt weeks ago and still have yet to wear it. i feel like it`s too precious to wear although it`s definitely a message that needs to be spread. 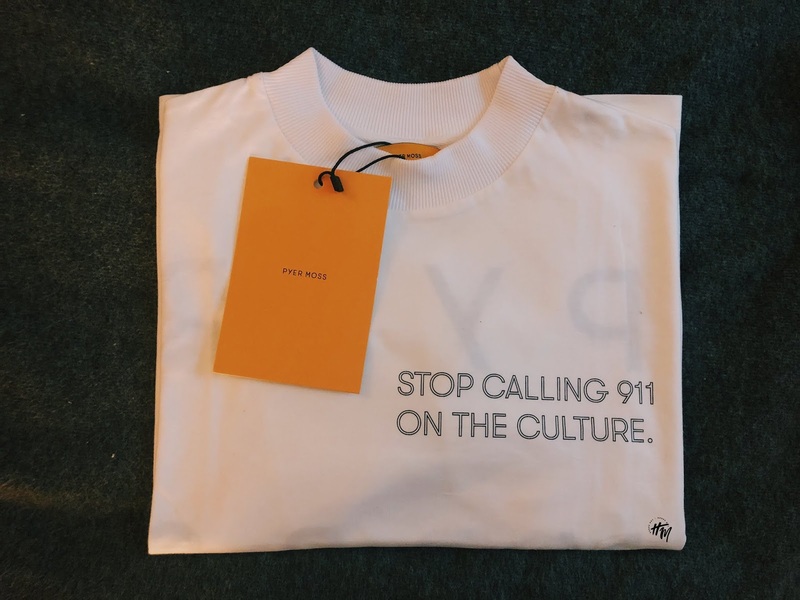 this amazing shirt was designed by kerby jean-raymond, founder of pyer moss. if you aren`t familiar with kerby or pyer moss, you need to get it together. the courage and strength of this man is so admirable. when he faced backlash for being political with his designs, he didn`t care. he remained true to himself, his brand and his real consumers. i say real because the people who knew what/who his brand represented encouraged these political statements and continued to support him. look at him now. research all of his accolades; earned and well deserved. pyer moss is so empowering and you can tell that the company prides itself on black empowerment + unity. with all of the craziness happening in the world recently, i think the shirt is a simple yet effective message. this is exactly why i knew i just had to get my hands on something. when this top was debuted on the brand`s official instagram, i was immediately drawn to it. within minutes, every size except for XL was sold out. it was amazing, yet unfortunate for me. however, i couldn`t wait for a restock so i purchased the XL anyway. once it arrived, i tried it on and still loved the fit. this shirt retails for $125, which is a pretty good price. there`s so many things that i want right now, but i have to be strategic in my purchases. pyer moss does limited releases, so i have to be on it when the drops occur. i look forward to building my wardrobe with pyer moss and i hope you all do the same.